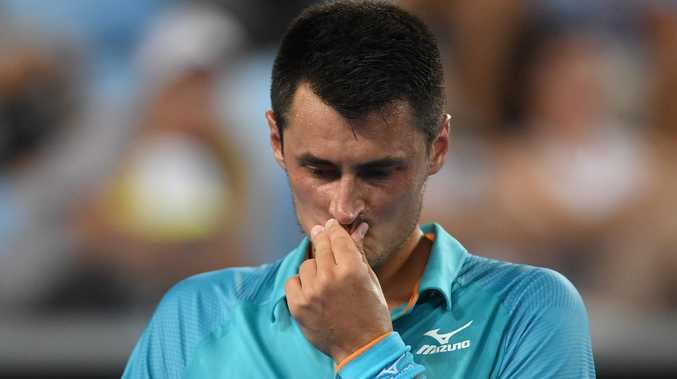 CONTROVERSIAL Aussie firebrand Bernard Tomic has pulled out of the Mexican Open, handing compatriot and Lleyton Hewitt protege Alexei Popyrin a walkover in the final round of qualifying. After winning his way through the first round of qualifying against Mexican Lucas Gomes, wildcard Tomic did not take the court against Australian Open surprise packet Popyrin on Monday morning (AEST). Tomic was dumped out of the first round of the Australian Open in straight sets by Croatia's Marin Cilic last month and ignited a firestorm in Aussie tennis by saying no one liked Hewitt and confessing he'd physically threatened the Davis Cup captain. Tomic lost to Austrian Dominic Thiem in the 2016 final at Acapulco and caused controversy in 2017 when he pulled out of a singles match after dropping the first set against American Donald Young, citing "unbearable heat" - it was 27C. He returned to the court later that day to partner Italian Paolo Lorenzi in a doubles match.